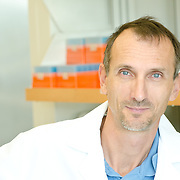 Volker Mai is an Associate Professor of Epidemiology and a member of the Emerging Pathogens Institute. He received a Ph.D. in Microbiology from the University of Georgia and a MPH from the Harvard School of Public Health. After completing his fellowship as a Cancer Prevention Fellow at the National Cancer Institute he joined the faculty at the Department of Epidemiology and Preventive Medicine at the University of Maryland, School of Medicine in Baltimore. He moved to UF with the establishment of the Emerging Pathogens Institute in 2007. Dr. Mai and his lab investigate the complexity and dynamics of naturally occurring microbial communities inhabiting the digestive tracks of humans. His studies seek to determine predictable patterns of species complexity and dynamics that can evaluate an individual’s susceptibility to disease. He and his lab analyze gut microbiota for associations between its composition, the host’s diet, and the host’s state of health or disease. Dr. Mai’s lab also examines whether or not an individual’s intestinal microbiota composition affects their susceptibility to intestinal pathogens (particularly those causing diarrheal diseases), and if manipulation of this microbiota can help to prevent disease frequency or severity. At the Emerging Pathogens Institute, Dr. Mai collaborates with other scientists by using molecular typing and sequencing approaches to discover novel bacterial pathogens. Two particular interests of his group include acute infectious intestinal diseases in infants and infectious causes of chronic diseases including cancer. In another project his group currently investigates the effectiveness of oral bacteriophage therapy for controlling potential pathogens.